There are plenty of good people doing plenty of good things in Bradford, but I reckon it’s fair to say that we’ve yet to get to grips with this whole restaurant malarkey. Course, there are places in town where you can sink good booze while picking at nice things from wooden boards, there’s proper pizza to be had, and my ghee-sodden arteries are testament to the city’s unparalleled curry scene; but the point stands that if you want to hammer three courses and get amongst a decent wine list you’re going to be looking – for now, at least – beyond the city centre lines. 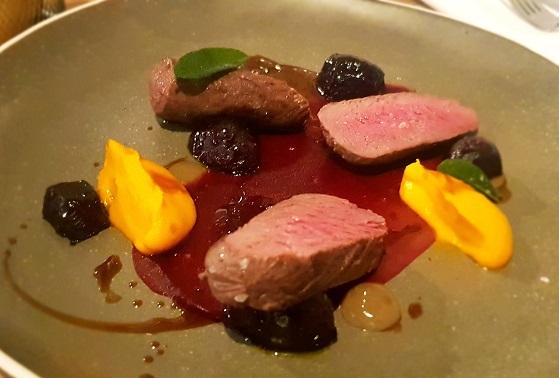 Which brings us, after a few looseners at Saltaire’s bustling Cap and Collar, to Shipley, where the Waterside Bistro is quietly getting on with knocking out chef Paul Huddleston’s tight canon of smart and satisfying dishes down there by the canal. 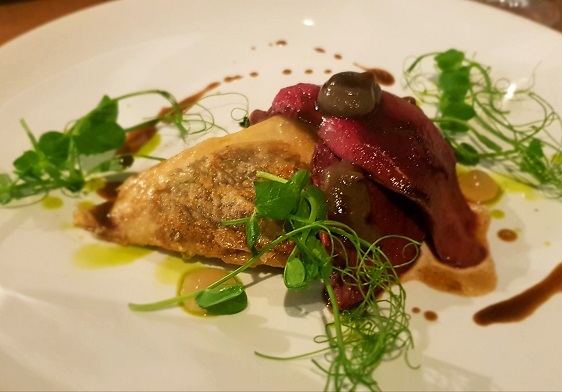 After an appetiser of barbequed venison with beefed-up brown sauce – a winning start – we land a couple of chunks of chubby pigeon – lightly gamey, properly pink – with a samosa so good it could go toe-to-toe with any of the offerings from the curry joints round the corner. The pastry is crisp, the filling pungent with cumin and its heady mates. From Yorkshire’s parklands to the Punjab in about three bites. From the punchy to the plush. 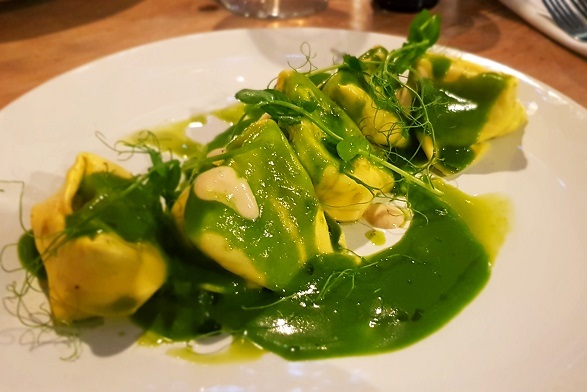 The age-old spinach-and-ricotta-pasta combo could never be accused of leaping from the page as an eye-catching zinger, but if I’m going to scoff this kind of ‘comforting’ food it’s this kind of chef I want to have it cooked by. And by that I mean one who, through some dark art, is able to make these dowdy components come together in a way that has me swiping the lot. There’s bite in the pasta (A1 stuff itself), the filling’s been helped along with a healthy heave of seasoning and he’s done something to the spinach to create a sauce that tastes better than it should. Of course, I’d get the bubble and squeak cake next time, but I ordered under duress and it turned out fine. 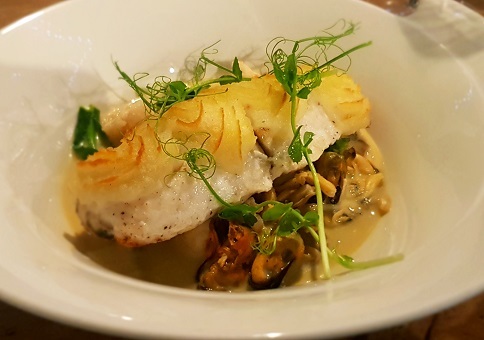 Fish pie – in reality chunks of meaty hake topped with pureed then bronzed spud – comes with a clam and mussel sauce that’s so ‘just right’ it should be siphoned off and served as slammers at the bar. In the likelihood that my suggestion is swerved I can also recommend the dredging of their beef-dripping chips through it. If, after reading this, you’re inclined to visit the Waterside then bag yourself the venison main while it’s still on. 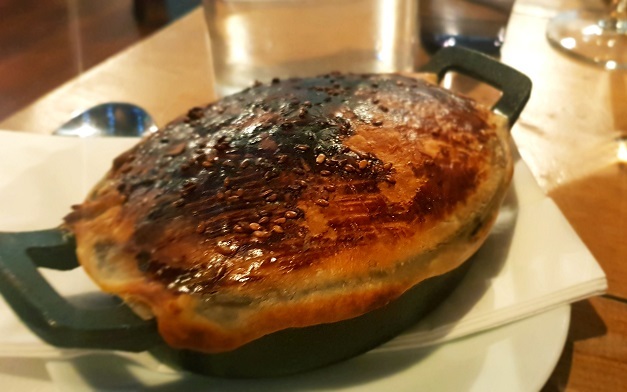 It comes with a pie, you see, and any dish that comes with another dish – especially a pie – mustn’t be ignored. There are pucks of expertly cooked loin – poached and then roasted in butter to a rosy pink – accompanied by flourishes of beetroot and carrot that add just enough sweetness to cut through the meat’s faintly wild tang; while the pie filling’s been stewed to yielding in Yorkshire gin (haven’t we all?) and comes with the appealingly old-school double-header of gravy and pastry.